Dinner plate that complains when you eat too fast – ¿¡ tjongolongo ?! Swedish scientist have developed a dinner plate that will actually speak to you when you’re eating too fast. The Mandometer is an electronic scal which will fit under a plate and has a separate small screen. The food is weighed before you start eating. As you start to eat you will be able to see on the screen how fast you’re eating. If you’re eating too fast the plate will tell you to slow down. 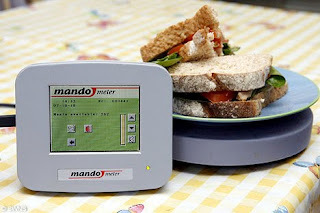 The Mandometer was developed for overweight people to train them to eat more slowly so that they will feel ‘full’ quicker and eat less, resulting in weight loss. I do think it’s an interesting invention though, I wonder if it will really help people to lose weight though. In the end losing weight is for 80% a case of will power. What do you think, is the Mandometer the next best thing when losing weight?